The Lotus Elise and Exige have unique requirements when it comes to using a jack, jack stands, and lifts. Their unique aluminum construction and mid-engined design can lead to some pretty awful situations if done incorrectly. The Elise/Exige have 3 sets of rear jack points. Two of which are not only unmarked, but they are hidden by the engine belly pan. This little guide will help keep you safe so you don't make any terrifying mistakes. 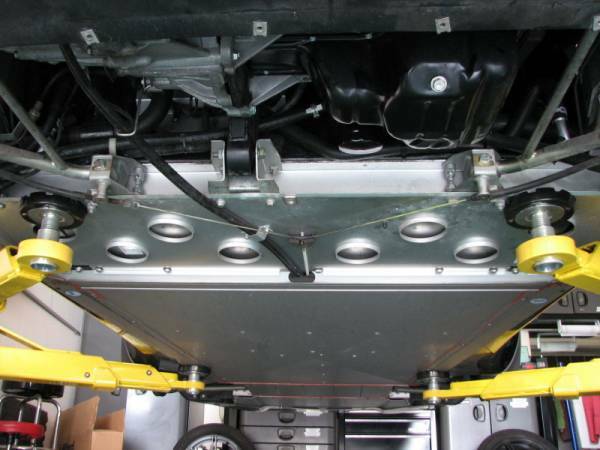 For 2 post lifts like the one in the image above, you must use the rear lift points hidden beneath the belly pan. For oil changes and simple jobs where the wheels can stay on, use a set of Rhino ramps or lower-profile Race Ramps. I use them regularly with no issues. Admittedly, at first it's a little strange backing up onto them, but this is the fastest and simplest way to make some room under your car. Lift Points B are up front, aft of the front wheels. They are marked by stickers, and pretty easy to spot. However, they are located on a nice flat aluminum section that typical jack stands will damage. Be sure to use a nice thick pad or jack stands made for flat-bottomed cars. I've seen quite a few people use hockey pucks with traditional jack stands, but I just can't bring myself to do it. To me, it seems a little unstable, and this is no place to cobble a solution together. If you're using a lift, these are a perfect place for the front pads. Lift Point A is located in front of the rear wheels**, also marked with stickers. These are the one's you need to be cautious with. 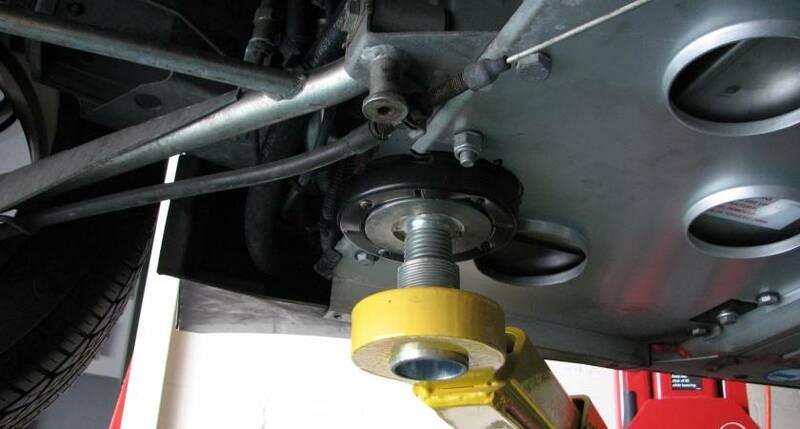 They are located too far forward to properly support the vehicle for any mechanical work. Lifting from A and B and removing the front wheels is enough to topple the car off a lift. Remember, the car's weight is 60% in the rear, behind these lift points. I often use these as a jack point to lift the side of the car onto jack stands as it lift's the whole side of the car. Lift Points C are hidden under the engine belly pan. The belly pan must be removed to access them. These lift points are perfect for use with a 2 post lift, in combination with Lift Points B. Note however, that they are completely unmarked. What you're aiming for here is a structural I beam that spans the width of the car. It's located above the sheer panel, at the rear-most edge of the sheer panel. Do not place the lift pads forward of this cross-beam as there is nothing there but the fuel tank. Lift Points D are hidden under the diffuser. The diffuser must be removed to access them. These are the rear-most lift points usable on the car. With the diffuser off, it's easy to see. 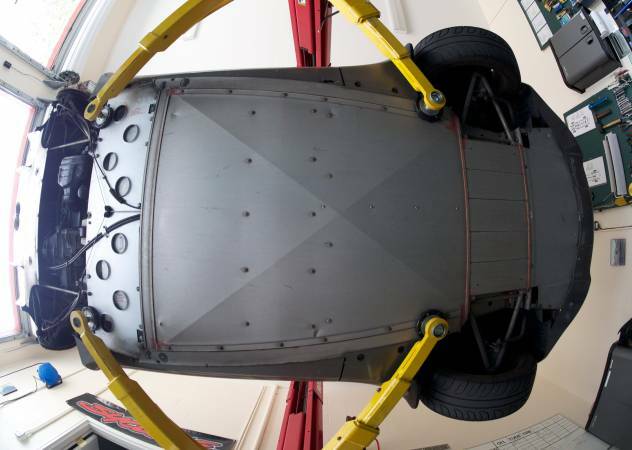 It is the structural member that supports the rear engine mount, rear lower A-arms, and the rear toe links. I use these points when performing large engine projects on the car. These in combination with point C will give you a number of options to jack and support the car safely. These are typically unusable for lifts. Ramps are the easiest and probably most useful. I use them for all fluid changes and regular maintenance that doesn't require taking a wheel off. When the wheels come off you've got no choice. You'll need a lift or some combination of jack and jack stands. You can use a jack under any of the lift points, just be sure to think about the balance of the car when you start working. If you need all 4 wheels off, you'll definitely want to avoid using stands under Lift Points A. 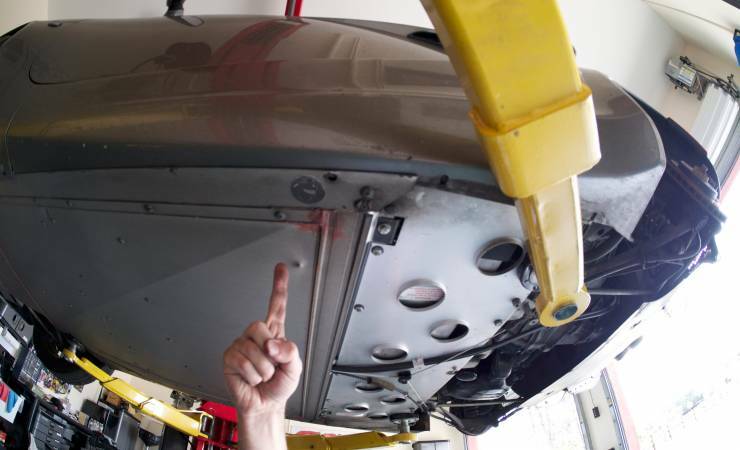 If you're using a lift, remove the belly pan, and use lift points B and C.